You can not stop progress ! We're hiring experienced galactic truckers to fly gigantic ships through the most dangerous areas of the galaxy. Being prepared to defend your ship at the risk of your life against intruders is a plus. Accepting to pay back your employer in case of damage is a real advantage. Send CVs and cover letters to CORP INC. right now ! New Technologies: New tiles to build your ship, including a way to protect yourself from intruders who might attack you from inside your cargo ship; Support Team: Assemble your team of specialists to make your space transportation business more efficient; New Vessels: Trays and special rules for Class IIB, IIIB and IV ships; New Adventure Cards: New Adventure Cards for Packs I, II and III. And a completely new package for Class IV ships containing improved versions of maps you already know as new challenges that you dare not even imagine; Intruder: Watch out for these new Adventure cards depicting Intruders trying to destroy your ship and swallow your crew. Be careful this game is an extension of Galaxy Trucker ... + 1 more+ 1 more and cannot be played alone. 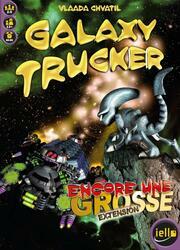 To be able to play it you must have a copy of the game Galaxy Trucker ... + 1 more+ 1 more.